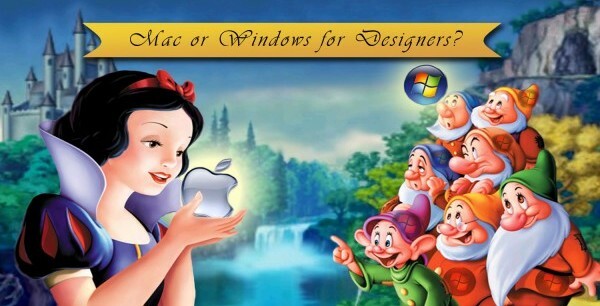 Mac or Windows for Designers? Microsoft’s Windows operating system has long been the top reigning platform for computers all over the world. In fact, according to data released by Netmarketshare, the most recent version of Windows – Windows 7 enjoys a chunky 42.76% market share for desktop and laptop computers worldwide while the Mac OS X only has a 7.78% market share. In a survey conducted by You The Designer in 2011 from over 9,000 graphic designer respondents, we found out that 41% or around 3800 designers prefers to use Apple’s Mac products as their primary device for their design projects. On the other hand 35% of the respondents say that they use a Windows-based machine for their work. So based on our data, even though majority of the world’s population use Windows PC; designers in general are split into using either a Mac or a Windows powered computer. So, given that the design and technical features of Mac and Windows are oftentimes overlapping with each other; which system is the most suited for graphic designers? Here’s a quick comparison of the two OS to help you guys figure out which system to get for your (new) computer. Although Apple only holds a minute portion of the market share for desktop and laptop computers, their efforts in creating a familiar and easy-to-use environment for their customers have slowly but steadily gained popularity over the past few years. But what makes Mac a hit to designers? Hardware-wise, Mac and Windows-powered machines use relatively the same breed of components. Both are usually powered by Intel processors and AMD graphics cards, and both make use of practically the same amount of memory. But Apple prides itself with speed through efficient use of computer resources. Based on numerous consumer feedbacks, Mac devices exhibit less lag when handling multiple processes and applications compared to Windows PC, which is particularly useful for designers who handle multiple files at the same time. And with future Mac models to likely sport a high-resolution retina display, designs and illustrations are sure to appear clear and vibrant all the time. Gestures are also a nice addition to the Mac. These gestures allow for a smooth and convenient way of navigating the different functions and applications that the operating system features. However, although fully customizable, you still need to remember all the gestures that correspond to each command or program. Apple products are also (although not immune) less prone to malicious attacks such as viruses and malware. And on top of it all, the premium, sleek and stylish design of Mac-powered products can somehow give a designer a small piece of inspiration while working. Unlike Apple, Microsoft’s strategy of keeping their followers is not by wooing them with stellar graphics or fancy menus. Instead, they opt to satisfy their customers by providing them a very familiar and intuitive user interface that has been improved little by little to cope with current trends. People are generally reluctant to change so this strategy has paid Microsoft millions of dollars in the past. By making their OS relatively the same in terms of usability and function while adopting a few cosmetic upgrades, Windows has managed to maintain their fan base and avoid users to migrate to the much better looking Mac. Windows computers are also much cheaper compared to devices that natively run Mac OS. The wide distribution of Windows has created a competitive environment in the market which drives prices down. Conversely, products both hardware and software that are compatible with Windows far exceeds that of the Mac, so users who use their computers for other purposes than designing might be better off with Windows. However, its popularity is also one of its weak points. Since little has been changed with Windows’ architecture, hackers from all over the world has done a lot of practice with the operating system. Viruses, malware, spyware and phishing techniques now plague the internet; and plenty of them are designed to inflict damage on Windows-based devices. Moreover, no significant change has been made to the OS to improve its efficiency in using a device’s hardware, so the OS still doesn’t offer the same fluid and speedy experience (at least most of the time) that Mac users are currently enjoying. At the end of the day, although many people are highly influenced by brand loyalty, the choice between using a Mac and a Windows device still falls to how one uses the computer to do things on a daily basis. For those who are looking for a gorgeous looking interface with hot-knife-through-butter performance, the Mac OS might be a good choice for you. On the other hand if you’re someone who prefers to stick with things that you’re already accustomed to and you’re okay with average to above average performance for the same hardware, then go ahead and take a Windows PC. What’s your take on the Windows vs. Mac battle? Tell us by leaving a comment below. You can also add us on Facebook, Twitter and Google+. Also, don’t forget to subscribe to our RSS feeds for your daily dose of inspiration, design news, and creative awesomeness.